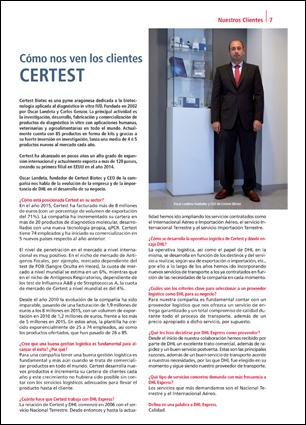 Published by the DHL transport company, “Expressa” magazine includes an interview with Óscar Landeta, CEO and Founding Partner of CerTest Biotec, S.L. Landeta reviews the upward trajectory of the company in the recent years and the importance of logistic activities as a key to the operational development of the company. Click here for the full interview. (.pdf 62,5 Kb), only available in Spanish language.